The construction, originally build in 1927 and signed by one of the exponents of the neo-romanian style, arch. 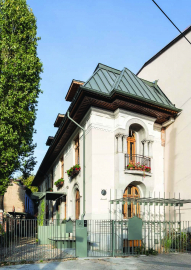 Florea Stănculescu, was used as a family house. 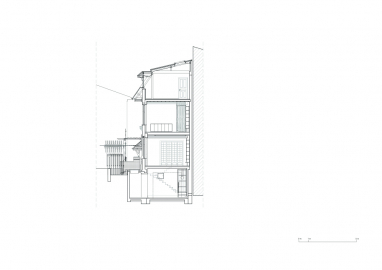 The main challenge of the project was to achieve, by engaging minimal resources, a new status of a public function and representation for the Bucharest Branch of the Order of Architects of Romania. 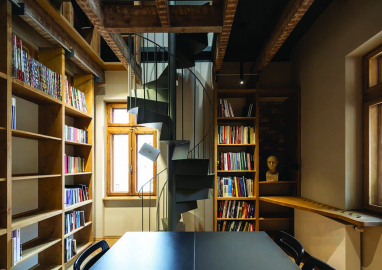 The theme of the project was subject of a local competition for the conversion of the house into the Headquarters of the Bucharest Branch of OAR, with offices, library, meeting spaces and workshops as well. 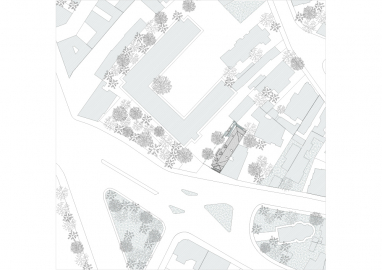 The plot is part of a historical area of Bucharest, yet in a de-structured urban square. In this unequal context, the building appeared unaligned, in its unicity, which, paradoxically, give it a delicate appearance, as a fragment of the interwar city brought nowadays. We tried not to visibly intervene therefore the project was about finding the extent to which the intervention gesture may remain unobservable. 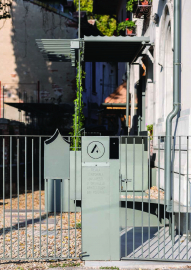 The project speculated this “hinge” location in between educational functions and residential to create a link with Cervantes High School to facilitate architectural curricula in partnership and, also a direct link from the basement to the public street. Understanding the context helped to generate a public infusion and a connection with the neighborhood at the same time. The small house, with a footprint of 118sqm, has the typical subdivision for so called „wagon-houses” of the city, with comunicating rooms by glass-doors, the first floor with bedrooms, underground and attic used just for annexes. 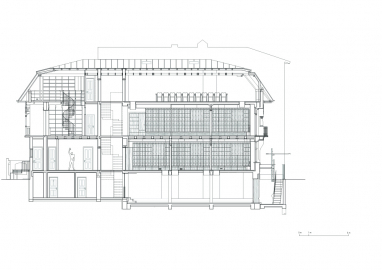 We worked for densification but in respect of this, as we did not want to touch the integrity of the typology. The building, not inhabited for many years, was in a medium state of degradation due to water infiltrations. 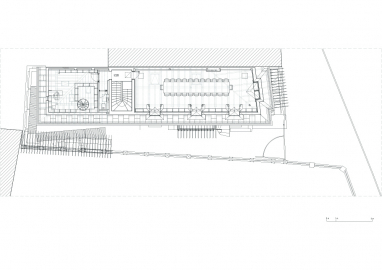 The intervention involved a discrete extension on the main interior spaces, making new spatial and visibility connections between the levels as to indicate the wholeness in each part of its interior. So, the slabs were punctured by “glass eyes”, and the library area was developed on two levels that leave apparent the old wooden structure. Likewise, we aspired to create similar openings to the context, to the street and to neighborhoods. These openings, noticeably but discretely, are to be “captured” in time by the garden, through the fragile but expressive metallic structures done from reinforcement profiles. The structure of the existing building is made of load-bearing masonry with wooden floor beams. 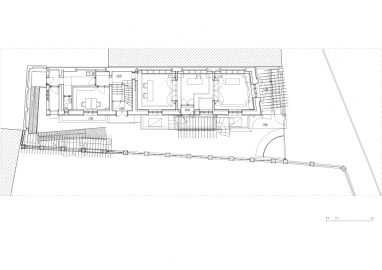 -	lowering the underground level and the lateral extension with niches from the hall. -	continuation of the roof over the library. 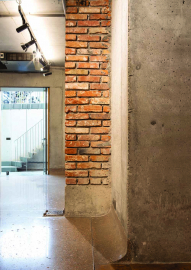 The interventions of consolidation for the up mentioned were consistent for the basement floor and attic, using a concrete slab, and of minor importance at the ground and first floor, were we only reinforced the wooden beams. 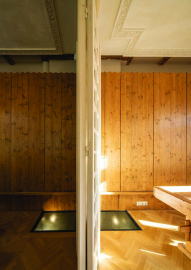 We used the common materials of the house (ex: the pinewood) in uncommon situations (ref. the “curtain” doors of the wall storage) to underline the new. The penetrations are in steel tubs as they express the perforation of the concrete slabs.